One of the most unique and electrifying bands in the already overflowing creative melting pot of the Western Australian music scene, Bats are a most pleasant phenomenon... a rock band daring to take us on a journey to new and exciting places. The reviews for the band's early singles and album sneak peak have been outstanding; praising Bats for both their utter level of finesse and their raw, rock'n'roll core. This balance, owed in no small part to straight-up good songwriting, makes Bats the incendiary musical experience they are, both on stage and in the studio. Not surprisingly, the personnel involved in Bats are no strangers to WA's rich, highly competitive music scene. In fact, it's no arse-kiss to say that the band are more or less rock royalty in their small but talent-heavy home town. Frontman and Bats' chief architect, Michael Paver has thus far fronted several of Perth's most-loved rock acts - from the bar room sludge of The Slim Pickins, to the classically enthralling Scotch of Saint James. But a band is not one man, and Bats are armed to the gills with gun players: guitarists Jozef Grech (The Infidels, Project Mayhem) and Timothy Hamzah (Belle Ends, Slim Pickins), bassist Pete Acklin (The Volcanics) and drummer Tim Stacey (High Horse, Ruby Boots)... all of whom are considered to be among the top musicians in Perth. Finally unleashing their long-awaited debut album, Bats are taking to the back half of 2017 with purpose and vigour. The record itself is a music-lover's dream... a full- length journey through the exquisite twists and turns that Bats' overactive imagination can conjure, performed with every atom of energy by the band, and produced to sonic perfection by Andy Lawson. Ranging from the crookedly psychedelic overtones of Truthless, 24 Hours, and Tarantula, to the hazy, hypnotic grooves of Alexus Nexus and BIG, Bats' debut album is a highly stylized, stunningly textured work of art... crafted with no attention to detail neglected. Produced by local legend Andy Lawson, the album (fittingly titled Truthless Faithless after its opening and closing songs) presents the sonic scope of Bats in all its toneful, bombastic glory. One of the best emerging live bands in Australia, Bats are on a mission to find their people wherever they reside. 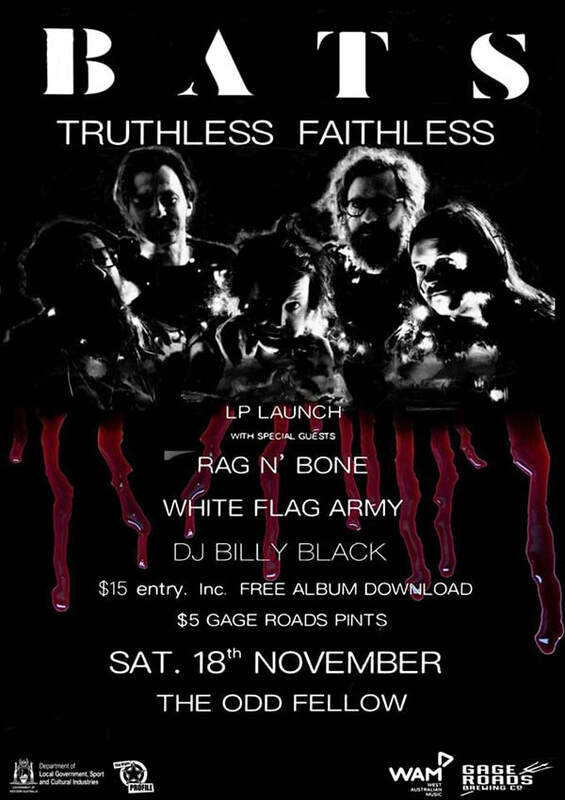 Truthless Faithless is like a beacon calling out to them through the dark, ushering in a new vanguard of rock music and its devoted followers. There is an itch that only pure rock'n'roll can scratch, and this is it. Truthless Faithless is available now on Spotify. Tickets are $15 on the door which include a download card for the album and there are $5 drink specials supplied by Gage Roads on the evening.